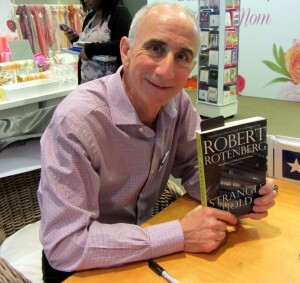 On a recent trip to Toronto I met Robert at Indigo when he was there for the release of his 4th book Stranglehold. Detective Ari Greene is back, and oi vey!… he’s got himself in a real mess. He’s been carrying on a secret affair with Crown Prosecutor Jennifer Raglan. Their usual Monday morning rendezvous comes to a crashing halt before it even begins when Greene arrives at the seedy motel as per usual, and discovers her dead body. Standing in the motel room stunned & shocked, trying to analyze the situation, it takes him a moment to figure out he’s been set up. Poor Ari! He has ample opportunity to give his version of the events to the police. He’s been on the investigating side of the law for years. He knows how this works. Knows the ropes he has to climb to get out of this nasty situation he’s landed in. But he wants to be the one who discovers who murdered Jennifer so he keeps his trap shut – no matter how further and further into the muck he gets stuck. Detective Daniel Kennicott, his co-worker, is handling the case, and it’s because of Greene’s great training that he’s able to put 2 and 2 together and figure out Ari was Jennifer’s lover. And so the story goes (I don’t want to give away too much). Crisp writing, interesting plot, humour, and local interest (Lordy! wait til you read about Mayor Hap Charlton!) – how could I not like this? Plus in his “other” life he’s a criminal lawyer so Rotenberg knows how to create intriguing fiction from years of navigating the legal world, and I am always fascinated, and often shocked, by what I read. Our old favourites are back, including – surprise! – Mr. Singh from book #1. Remember him? He was the newspaper carrier who discovered body #1. If you’ve been following events in TO recently you will get a real kick out of this book. It’s very au courant. I loved it! This book is historical fiction. Melanie Benjamin states in the Authors’s Note that she hoped to make Ann “the heroine of her own story”, and this she did. She wrote an amazing book. I love historical fiction and I’ve read a whole stack of books in the past few years that highlight the exceptional fortitude and character of women standing in the shadows of famous men. This book is probably the best of the lot by far. This is quite the book! A Tale for the Time Being by Ruth Ozeki will blow your little mind. It’s is very original. Not like anything I’ve ever read before. It’s fiction, with footnotes on some pages that translate Japanese words or expressions into English. It has appendices that explain various things mentioned in the story in detail. In Japan, time is running out for young Nao Yasutani. She wants to record the story of her great-grandmother Jiko who, at 104 years old, has been an anarchist, feminist, novelist and Zen Buddist nun. This diary that Nao (pronounced Now) writes somehow ends up inside a Hello Kitty lunchbox, along with a few other interesting artifacts, washed up on a remote island in the Pacific Northwest of Canada. When Ruth discovers this strange package while walking along the beach, she brings it home and quickly thinks it could quite possibly be debris from the 2011 tsunami. The more she reads of Nao’s diary, the more involved she becomes in trying to discover the meaning of the strange contents, and whether or not Nao survived this catastrophic event. Believe me, you will be shocked by what you read, educated (who knew Japanese crows could be so fascinating! ), filled with laughter & horror (you think we have a problem with bullying in our schools!! ), “enlightened” (there’s even a page telling you how to meditate – remember Jiko is a Buddist nun) and often stop and think about what you just read (the parrallel between the flow & containment of water at the Fukushima nuclear plant with the flow & containment of information in our high-tech world is brilliant). Oseki is an amazing writer, but be forewarned, at times the descriptions are difficult to read. And some of it is pretty heavy to digest. I guess I’m slow on the take because I was almost half way through the book before realizing that Ruth, one of the characters in the book, has the same name as the author, they’re both writers, AND they both have a partner named Oliver. (I always read the “Acknowledgements”.) Fact turned into fiction, in tiny bits maybe? It made me wonder how much of the British Columbia part was based, even slightly, on their lives. When I picked up the book I wasn’t totally sure it was my “type” but I decided to give it a go anyway. Now I can’t say enough good things about it. Somehow it has flown under the radar screen, and I’m not sure why. It deserved WAY more praise and publicity than it’s been getting. Buy the book and spread the word. Tweet… skype… blog… facebook… do whatever it is you do and get the word out!! If you want to see something beautiful go to http://www.ruthozeki.com/ and play the little video she provides as a backdrop to her book. It is breathtaking. And read about what the British publishers have managed to do with their version of this book. I really want to get my hands on one of theirs now.